December 2018 saw the Medium Combustion Plant Directive (MCPD) come into force for new plants, with the aim of reducing sulphur dioxide, nitrogen oxides and particulates in exhaust gases from combustion plant rated between 1 MW and 50 MW thermal input. This stringent emissions legislation will have a wide-reaching impact, affecting new and existing combustion plant such as gensets, boilers and gas turbines at as many as 150 000 sites in Europe. With diesel fuelled generators playing such a critical role in many on-site power generation applications, operators will be looking for reassurances that their existing plant will reman unaffected. Some sources have suggested that achieving the new limit on nitrogen oxide emissions with a typical four-stroke engine process will not be feasible. Operators of existing plants still have a while to comply (registering by 1 January 2024 for plant over 5 MW and by 1 January 2029 for plant between 1 MW and 5 MW (thermal input)). However, with the long lifespan of much of the existing plant already installed in the UK, for example, many businesses may want to take steps to upgrade an existing installation, rather than replacing with a new, already compliant model, especially if the installation is performing efficiently and reliably. The first area to consider is the application of the diesel generator, specifically the number of operating hours. Some generators can receive an exemption if they operate for no more than 500 hours per year when measured as a three-year rolling average for new plants, and a five-year rolling average for existing plants. The regulations set strict NOx limits, ranging between 190 and 205 mg of NOx per Nm3 for power generation equipment up to the 50 MW threshold, which may limit, but does not exclude, the potential of diesel to continue to be used as a power source 24/7. Reducing NOx emissions in a conventional four-stroke engine to the levels required for continuous operation is problematic and both operators and regulators need to be mindful of the engineering limitations. However, on a positive note, the vast majority of diesel generators are commissioned on a standby basis, and therefore will fall below this threshold, with a caveat that operating hours should not exceed 50 hours per annum. This means that there is already a vast, installed estate of existing diesel generators in the UK and the challenge for manufacturers is to offer engineered solutions that can reduce NOx emissions while still continuing to offer engines with a high power output. Gas fired generators, while proven technology, have not typically been specified for standby power applications as they cannot offer the same rapid start-up as diesel alternatives. Connected to a gas line, they are served by a readily-available, consistent fuel source, meaning they tend to be employed in prime power applications. However, gas fuelled generators can often be larger and take up more floor space and the engine operating lifecycle in prime power applications differs from that of a diesel generator set. 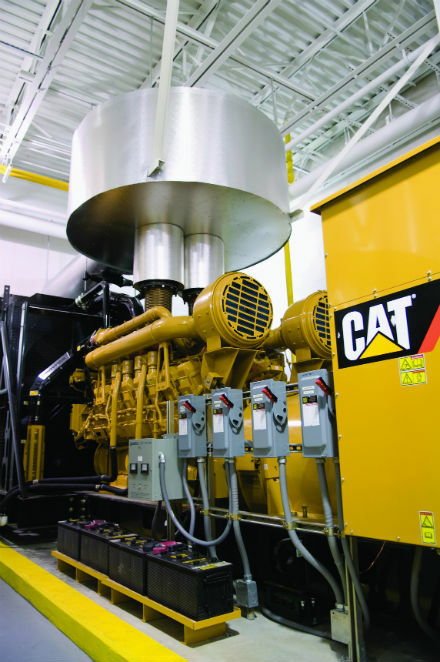 As a cleaner burning fossil fuel, engine suppliers such as Finning and Caterpillar are continuing to make engineering advances to further extend the ability of gas fuelled engines meet back-up or emergency power requirements. Diesel engine technology combines very high thermal efficiencies with good fuel efficiency, resulting in low carbon dioxide emissions. However, high temperatures in the combustion chamber, while helping to reduce the production of soot, also increase the levels of nitric oxide (NO), which when released in to the atmosphere, oxidises rapidly to create nitrogen dioxide. The trade-off is typically to lower the temperature in the combustion chamber to reduce the amount of NO produced, but this increases the likelihood of soot formation. It is this area where significant engineering advances are being made. For example, Finning now offers a range of air-to-air after cooled, or charge-air cooled engines from the Cat 3516 range. This technology cools the engine air after it has passed through a turbocharger but before it enters the combustion chamber, effectively returning the air to a lower temperature for optimum power. The decrease in air intake temperature enables a denser intake charge to the engine and allows more air and fuel to be combusted per engine cycle, increasing engine output while lowering combustion temperatures to limit NOx production. Another area that operators may want to consider, and which is already well-proven in mobile engine applications such as automotive and marine, is the introduction of selective catalytic reduction (SCR). Selective catalytic reduction uses a urea-based diesel exhaust fluid (DEF) and a catalytic converter to reduce NOx emissions. DEF is injected into the exhaust air stream where the energy contained in the hot exhaust gas causes the NOx to evaporate into ammonia. Once the ammonia and exhaust gas reach the SCR catalyst they decompose, breaking down into nitrogen gas and water vapour. Most operators expect fuel consumption to increase if emissions are lowered. Interestingly, engine-out NOx and fuel consumption are inversely proportional, meaning the greater the engine-out NOx, the lower the volume of fuel consumed. In most cases, the cost of DEF is more than offset by the engine’s reduction in fuel consumption. Unlike other NOx reduction technologies, engines fitted with an SCR system will operate without interruption even in the event of SCR failure, or if the system runs out of DEF. When specifying an SCR system, a key question that operators will have is, ‘How much DEF will be consumed?’ In short, this will depend on many factors, including the annual engine running hours, duty cycle and the concentration of DEF being used (32.5% and 40% concentrations of high-purity urea are available). It is recommended that operators work directly with an SCR specialist to determine the volume of DEF that will be consumed. Only a pre-mixed solution of DEF from a trusted partner should be used in a SCR system, to guarantee the correct purity and concentration of urea. The supplier should also be able to demonstrate the DEF conformd to ISO 22241-1 standards, ensuring the appropriate standards for quality, handling, testing, transportation and storage have been met. Using DEF that has been incorrectly blended could potentially result in irreversible damage and, ultimately, engine failure. Reducing particulate matter emissions is another concern for those keen to lower the environmental impact of diesel engines. However, SCR technology has now been developed that ensures no additional after-treatment equipment such as diesel particulate filters or diesel oxidation catalysts are needed, as in-cylinder enhancements ensure particulate matter output is in line with Tier 4 standards. This reduces total costs even further. Many maintenance issues that are often highlighted in other NOx reduction technologies, such as the need to change fuel filters more frequently, are not a concern with selective catalytic reduction. These systems are also relatively easy to install. There is much work being carried out in the stand-by market to ensure ongoing compliance below the 50 MW threshold, with engine manufacturers and suppliers continuing to make positive strides to engineer solutions that can help limit emissions. With a number of retrofit solutions available, such as SCR technology, the future for diesel continues to look promising – especially for those operators balancing their power demand with the cost implications of investing in new plant and equipment.